Vikings mixed with metal make for one great scene, and yes, cliche. Yeah, I admit it. And who cares? How can one possibly go wrong with mixing together swords, mythology, mead drunk from horns, and metallic music? Answer is, you cannot. So the metal world is inundated with bands that call upon Viking heritage and history to propel (row?) their machine. Who can deny the vicious, epic underpinnings of a band such as Unleashed? Or, as goofy and silly as they may seem on the surface, who can seriously hate the big, burly dudes in Amon Amarth, who make some of the most infectious, melodic metal you’ll ever hear? If you’re a doubter, go see them live. You’ll be won over. And now comes a new band King of Asgard to toss their horned helmet into the ring and profess their own allegiance to mighty warriors of days gone by. The band’s 2010 debut record “Fi’mbulvintr” was a decent effort, one that indicated the guys had some promise but also had a ways to go before realizing their full potential. They meant well and the songs weren’t too bad, but it didn’t really stuck to the ribs after a few listens. But it was enough to make me curious as to where they were headed, and now that their new album “…To North” has surfaced, we have some answers. Luckily what we find on this sophomore display is a band that’s growing deadlier, sharpening their songwriting skills, and adding more muscle into the fray than some of the other bands in the Viking camp. Their music is heavier and more toward the black metal terrain, and while they certainly can wow you with powerful hooks, that’s not all they have to offer. The quartet that makes up King of Asgard are no rookies. Vocalist/guitarist Karl Beckmann spent time with bands such as Indungeon and Infernal Vengeance; guitarist Lars Tangmark played with Mesentery and the Choir of Vengeance; bassist Jonas Albrektsson still plays with Bloodshed Nihil and Retaliation and used to be with Thy Primordial; while drummer Karsten Larsson remains with Falconer and also played with several other notable bands. So that’s a nice wealth of experience in diverse-sounding bands, and their combined time spent with other groups enables the guys to bring a lot to the table. Already on album two, KoA sounds like a well-oiled machine. Opening with a scene-setting introduction instrumental that’s full of horns and bravado, the band launches into “The Nine Worlds Burn,” a black metal-flavored crusher that is full of melody and a big chorus, with Beckmann howling, “Carry us home when we fall.” “The Dispossessed” has a glorious tempo, is full of unbridled passion, and has some killer chops by Albrektsson, who really steers this song and gives it its low-end oomph. “Gap of Ginnungs” is a song where the band’s personality really begins to shine through, from the gruff, growl-speak on the verses, to the folkish gang vocals over the chorus, to the surging lead guitars that could cause of tidal wave of emotion inside you. “Bound to Reunite” actually sounds a bit like Amon Amarth, the only time they really veer toward anything predictable, but that said, it’s still a worthy song and a fun listen. “Nordvegr” makes things go bleak again, with harsher music, murky atmosphere, and strong melodies. “Up on the Mountain” is the second-half highlight, with buzzing, jangling riffs that open the song, full ferocity as the track hits its stride, some acoustic passages to bring things back to Earth, and a truly sinister vibe throughout. “Plague-ridden Rebirth” is the epic of the bunch, clocking in at over seven minutes, and it invites sickness and death to sweep down and choke out their enemies. “Harvest (The End)” has some playful folk moments, and lets you regain yourself a bit, while the closing title cut is an interesting instrumental that would be a perfect seque to a new section of the record. If there was one. Instead, it’ll have to bridge the gap to record three, so there’s a bit of a feeling of disconnect for the time being until that platter arrives. 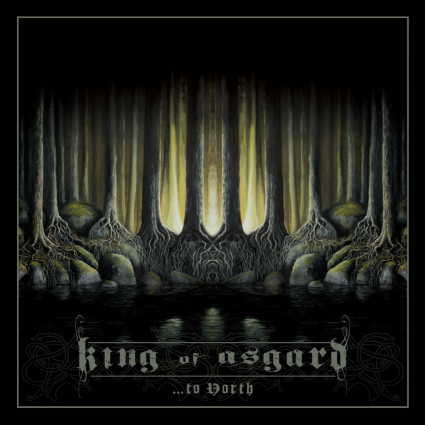 “…To North” is a solid building block for King of Asgard, and their promise is even more prominent now. I’d still like to hear them carve out a more defined identity for themselves and become truly their own beast, but there’s no real hurry. What’s on this album is way solid and punishing and makes me want to stay tuned to their career. It also makes me want to crush a horn of ale, never, ever a bad reaction to a Viking-themed metal album.